Everything the driver needs for those cold early morning starts. An ideal quirky and useful gift for the driver in your life. 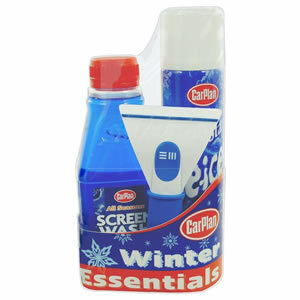 De-icer 300ml - melts ice quickly and effectively from car windows even at low temperatures. Screen Wash 500ml - carefully concocted formula removes dirt, grease, traffic film and insect deposits easily from your car windscreen, leaving a streak free finish. Easi Grip Ice Scraper - a comfortable soft-handle grip and convenient finger recess, making winter scraping easy.